Suicide is the 10th leading cause of death in the United States – AND it is preventable. September is suicide prevention month. The International Association for Suicide Prevention (IASP), collaborates with the World Health Organization (WHO) and the World Federation for Mental Health, to host World Suicide Prevention Day on Sept. 10, 2015. ‘Preventing Suicide: Reaching Out and Saving Lives’ is the theme of the 2015 World Suicide Prevention Day (WSPD). This year’s theme is designed to encourage all of us to consider the role that offering support may play in combating suicide. Suicide touched my own life in a profound way when my youngest brother, Scott, took his own life on July 1, 2007. I witnessed his struggle for many years. I talk more about this experience and how my family grieved in the accompanying episode of The Coaching Through Chaos Podcast, but for this post, I'm going to stick to facts that I want to share. As most of this information is cut and pasted from relevant sites dedicated to suicide prevention and research, credit is given accordingly. Why do we Need Suicide Prevention Education & Resources? • An estimated quarter million people each year become suicide survivors (AAS). If you knew someone who was suicidal, or you work in a community where there were no active suicide prevention programs, would you know where to turn? 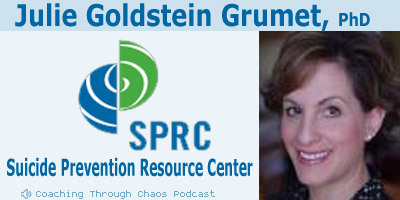 Today’s episode features Julie Goldstein Grumet, Ph.D., who is the Director of Prevention and Practice at the Suicide Prevention Resource Center (SPRC.org). The SPRC is the nation’s only federally supported resource center devoted to advancing the National Strategy for Suicide Prevention. They provide technical assistance, training, and materials to increase the knowledge and expertise of suicide prevention practitioners and other professionals serving people at risk for suicide. They also promote collaboration among a variety of organizations that play a role in developing the field of suicide prevention. • Suicide prevention grantees: Garrett Lee Smith Suicide Prevention Grantees funded by the Substance Abuse and Mental Health Services Administration (SAMHSA) to support suicide prevention work in Campus, State, and Tribal communities. • State suicide prevention coordinators and initiatives: individuals and groups in the state with the lead for statewide suicide prevention. • College and university staff involved with suicide prevention efforts on campus. • American Indian/ Alaska Native communities: Individuals working with native populations to support suicide prevention and mental health promotion. • Health and behavioral health care providers who play a role in identifying and helping individuals at risk for suicide. • Professionals providing social services in their community and organizations that can help reduce suicide rates among the populations they serve. • Increasing the use of alcohol or drugs. • Showing rage or talking about seeking revenge. • Displaying extreme mood swings. - Suicide is preventable. Recent research is beginning to show a correlation between suicide prevention programs and decreases in suicides in those areas. - Most people that are thinking about suicide absolutely feel hopeless and wish for feeling better, not necessarily to die. The wish to die often is born out of the despair and hopelessness. - If someone verbalizes a suicidal thought, you should absolutely take it seriously. It’s imperative to share that thought with someone who can intervene and assess futher. You might feel uncomfortable about that, or your friend may ask you not to tell anyone, but jeopardizing your relationship is much wiser than pleasing them in that moment. - Talking about suicide, or asking someone if they are suicidal will not cause them to become suicidal. There are some people that “just get depressed”. While that may hinder their life and their well-being, they don’t move into a suicidal state. On the other hand, there are other people who may not even present as outwardly depressed but have suicidal thoughts when problems develop in their life. If you are concerned about someone you know, ask them if they have suicidal thoughts. Whatever answer you get will be better than never having asked. Be part of the conversation - show your support on social media! 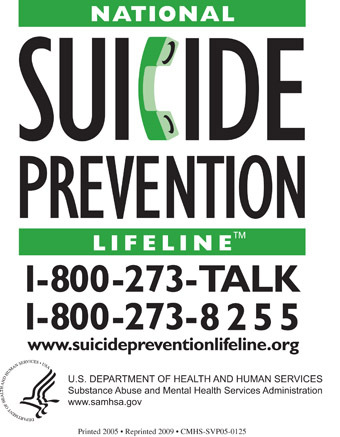 The National Suicide Prevention Lifeline: 1-800-273-TALK (8255): You can call this number 24/7 to speak to someone about how you are feeling or to get help for yourself or someone you care about. The Suicide Prevention Resource Center - SPRC.org : The nation’s only federally supported resource center devoted to advancing the National Strategy for Suicide Prevention. They provide technical assistance, training, and materials to increase the knowledge and expertise of suicide prevention practitioners and other professionals serving people at risk for suicide. They also promote collaboration among a variety of organizations that play a role in developing the field of suicide prevention. SuicidePreventionLifeline.org: Not only can you call them at 1-800-TALK, but you can life chat with someone online, get information specific to helping young adults and veterans as well. They also provide resources on bullying, how to get help in your area and have other information you may need when feeling suicidal. Their online resources are also provided in Spanish. Save.org : The mission of SAVE is to prevent suicide through pubic awareness and education, reduce stigma and serve as a resource for those touched by suicide. Zero Suicide Program - zerosuicide.sprc.org : This is an SPRC program designed and committed to preventing suicide in health and behavioral healthcare systems. The approach of Zero Suicide is based on the realization that suicidal individuals often fall through cracks in a fragmented, and sometimes distracted, health care system. To do this, Zero Suicide requires a system-wide approach to improve outcomes and close gaps in the systems for better preventative care.